Guys, it’s been an roller coaster week of firsts for me: first time holding my new baby nephew, first iphone dropped in a sink full of soapy water and…my first cookbook, Easy Gourmet, available for preorder!! I’ve been keeping my book on the down low because I’m not sure how to talk about it. I try to think of what to say and all that comes out is: maofeisao ioajoejaw oajfoewjafs YAS!!!!! So, instead, while I gather my thoughts, I’m going to give you this Porchetta Recipe Redux, which happens to be a sneak peek into the book. Porchetta is truly one of the GREAT foods of Italy. 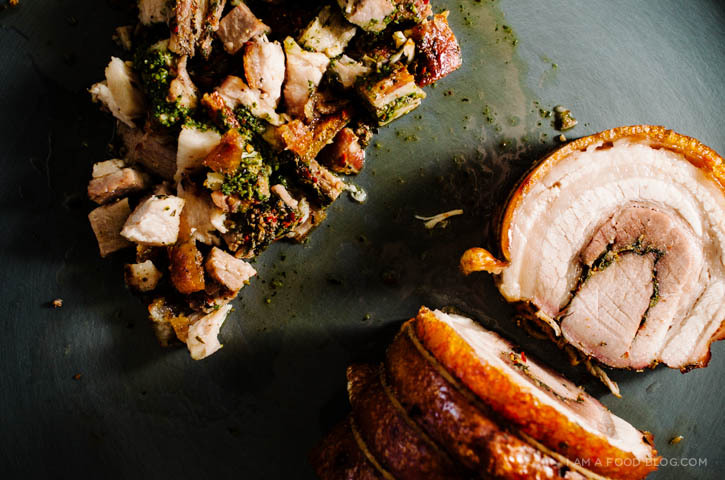 They do porchetta right – in Italy, if you’re lucky, you’ll be walking along a random side street and see a glistening, deeply golden brown, whole pig that’s been deboned, stuffed with herbs and roasted. Italians like to tuck it into pillowy soft bread and call it a day. I call it delicious. Of course, most people aren’t going to source a whole pig, let alone debone it. So, I’ve made a porchetta recipe that’s a little more practical, but just as delicious. Instead of a whole pig, we’re going to go for the infinitely more manageable skin-on pork belly and loin. You can do a full belly porchetta, but I like the contrast between the super-marbled softness of belly and the slightly leaner, more textured loin. 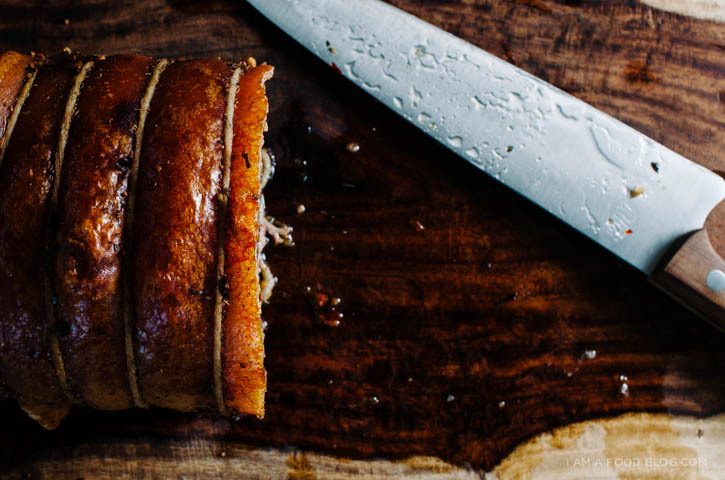 The best thing about porchetta (aside from the crisp crackling and juicy, juicy meat) is the fact that it’s fairly simple to make. Dare I even say…it’s Easy Gourmet?! 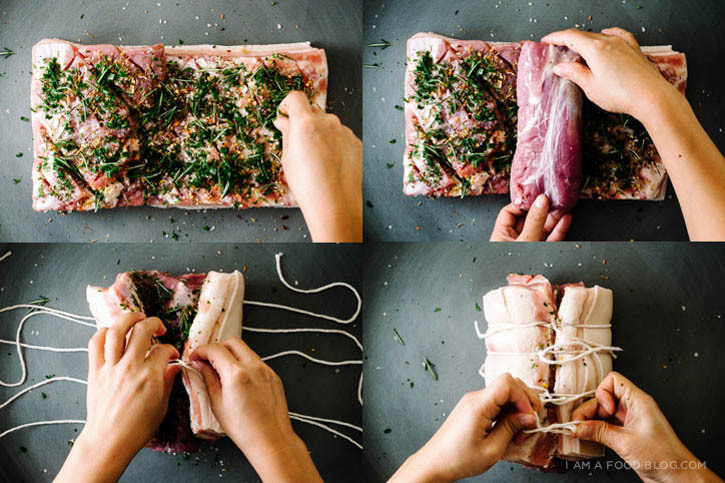 (Hahaha, please excuse me, I’m a little delirious) Seriously though, all you do is chop up some herbs, roll up pork belly around tenderloin, wrap it tightly in saran wrap, throw it in the fridge and call it a night. The next day, unwrap, pat dry and roast. Four hours of slow roasting later (and the most incredible smells), you turn up the heat to get some crispy crackling action and then it’s time for the hard part…waiting. Let your porky heaven rest for a little while before slicing in. It may be the longest 20 minutes of your life, but when you taste the results of your labour, you’ll be glad you waited. Eat it as is, stuff it into a sandwich, make a porchetta carbonara, throw it on a pizza…the possibilities are as delicious as a Choose Your Own Adventure Book. Now that we’ve talked about porchetta, I guess it’s back to the book. I honestly can’t believe this is actually happening. It makes my heart race, my palms sweat and generally gives me the ill feeling of extreme anxiety. I still can’t believe you guys come to my site…and now that a real, live, physical book is going to be…gah. I can’t comprehend it. If you’re so inclined to pre-order Easy Gourmet, I will forever be sending you virtual porchetta sandwiches and pictures of undeniably cute things. I’ll probably spend an inordinate amount of time trying to put my arms into my screen to give you a thank you squeeze. In all honesty, if you decide to buy my book, I will be truly humbled. I am a Food Blog and Easy Gourmet exist because of you, dear reader and that, is more than enough. But…if you do want to buy my book(! ), you can preorder it here: Amazon, Barnes and Noble, Books-A-Million and Indie Bound. A million xoxos to you. But seriously, guys, *hugs. * Thanks for making my dreams come true. 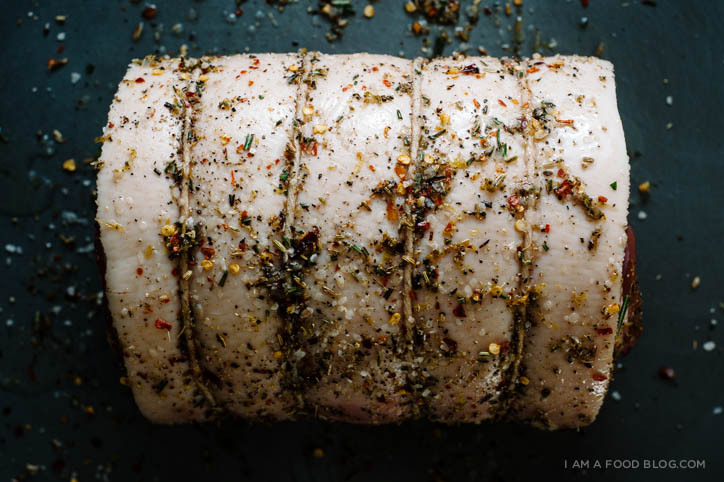 i am belly, i am loin: i am porchetta! 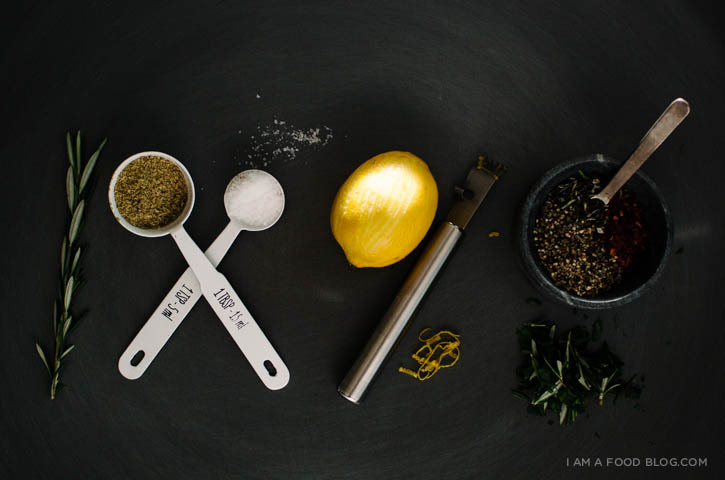 Combine the ingredients for the salt rub in a small bowl. Place the belly skin side down on a cutting board and lightly score the meat. Sprinkle on half of the salt rub. Spread out all of the herb rub and place the tenderloin in the centre of the belly. Tightly roll the belly around the tenderloin and tie together with kitchen twine. Rub the skin generously with oil and the remaining salt rub. Tightly wrap the porchetta in plastic wrap, place in a dish, and put in the fridge overnight. The next day, heat the oven to 275°F. Unwrap the porchetta, pat dry with paper towels and place on a rack in a deep roasting pan. Roast on the centre rack of the oven for 4 hours. Use a meat thermometer to check that the internal temperature is 160°F. Blast the heat up to 450°F and continue to roast for 20-25 minutes, keeping an eye on the skin. You want the crackling golden brown and crispy. Remove from the oven, let rest for 15-20 minutes, slice and enjoy! Oh, any my phone is totally fine. I did the bag o’rice thing and it WORKS! I’m so relieved. My god that looks delicious!!!! Wish I could get that through my computer screen and in my face right now!! Congrates on the book! STEPH! Way to keep your cards close to your chest!!! Congrats on the cookbook! I am SO excited for you!!! And this recipe looks amazing, as usual! Beautiful pictures! AHHH!!!! i am jumping for joy over here!!! your book is going to be AMAZING!!!! and this porchetta… did you just say porchetta carbonara?! gimme summa dat! Ugh, you should make porchetta just so you can make porchetta carbonara!!! Seriously, I could eat vats of it! Lady, you’re amazing. So psyched for the book. Oh my goodness that looks amazing!! And major congrats to you.. Can’t wait to get my hands on a copy..
Now that is exciting news! Stoked. Congrats Steph!! I ordering this for sure. To be honest, I don’t know if I can cook any of these stuff. Hehe but I love your pics and basically support you in general! Wishing you more cookbooks in the future. STEPH!!!!!!!! I’m so so so so SO excited for you and so thrilled and just so happy over all of this. You deserve every bit of this — the gorgeous, gorgeous book, your Saveur accolade, errthang. (I mean, just look at this porchetta!) A million warm wishes and hugs (plus a real-life hug in 28 short days!) I’m so honored to call you my friend and so thrilled for you. Thanks for every lovely word and image and recipe you share with us, dear friend. Aww, sweet Cynthia, you always make me *blush* I love you lady! You are the best!! Thank you!! Thanks Jennifer!! You are so, so sweet! You totally made my day! Congratulations!! I knew your book would be gorgeous, and I’m right. Damn why do I have to be always right? (Pls ignore me). Congrats again!! I LOVE it when you’re right Mandy!! xoxox Thank you! There you were, visiting Tokyo and eating awesome stuff and blogging like the champ that you are, and all the while, MAKING A BOOK. I am impressed and flippin excited to get a copy! This gorgeous roast is a perfect example of your exquisite photographs, endearing writing and accessible recipes… go, you! A book, of course — the perfect gift to the cooking world :) Congratulations!! Looks amazing! I wonder if its possible to get away with using just thick cut bacon? Or a really skinny slice of pork belly? I’m a minority here but I think the texture of the fatty parts of pork belly are just tooo soft and jelly like. That crispy skin though. I want that. You could totally use a skinny slice of pork belly, but if you do that adjust the cooking time because loin really doesn’t take that long. Or, you could do what I do when I’m at the butcher and ask them to hold up each piece of belly for you until you find one that has your perfect pork to fat ratio. The one in this photo was a bit to fat for my liking, but the butcher was starting to give me the stink-eye so I had to chose after looking at only 5 bellies :( The crispy crackling makes this recipe, so do it with belly!!! Congrats! I can’t wait to see the recipes included in the book. I know it will be inspiring. Congratulations on your book and new nephew! With regards to your iphone falling in the soapy wet sink, I suppose that is a first and we shall wish also a last… Anyway, your cookbook looks gorgeous, as does this preview recipe which you bet I’ll be trying out at some point. Cheers! Holy crapola you have a cookbook coming?!?!? CONGRATULATIONS YOU SECRET SUPERSTAR!!!! That’s amazing!!! I cannot wait to see it/hold it/read it!!! On a random note, I just got totally lost browsing through your momofuku blog. So many awesome posts!!! My total dream would be to bake/eat my way through the momofuku milk bar cookbook….if I could somehow not get diabetes, that is. Congrats again girl! This is huge!!!! Thanks Erika!! Oh yeah, I gained 10 pounds cooking through Momofuku…I wanted to do Milkbar too, but I think I would have been on serious sugar overload. Your Momofuku cakes are SO GORGEOUS! That’s some serious commitment girl! Congratulations! Lovely recipe and pictures. This looks amazing!!! 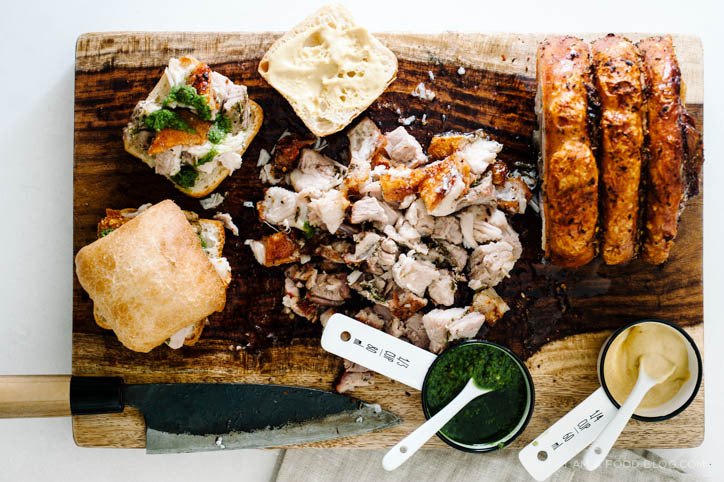 Porchetta might be one of the best foods ever. Seriously. And congratulations on the cookbook!!! The cover is gorgeous! Wow. This was incredible timing. My husband and I were literally debating if we should do a pork belly, or a traditional pork roast for an upcoming event. We decided to talk about it later, and I went back to my usual check out my fave blogs, and BAM. This. Decision made. YUM! Yum!! This looks amazing!! So excited for your book, I KNOW it’s going to be amazing!! Mouth watering, indeed! 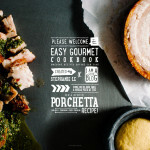 Honestly speaking then I was not aware with this Porchetta but after seeing your post I’m seriously excited about it and would definitely try it for once. Thanks for sharing. Second dinner and … even better, you’ll have leftovers!! I’ve always wanted to make porchetta, but (SURPRISE) I’ve been intimidated. You do indeed make it look very easy :) This looks ridiculously good. I’m an avid reader and a fan all the way from Singapore! Can’t wait to get my hands on your book! Good lord. This looks positively mouth-watering. this reminds me of my favourite sandwich in vancouver! what is the sauce? 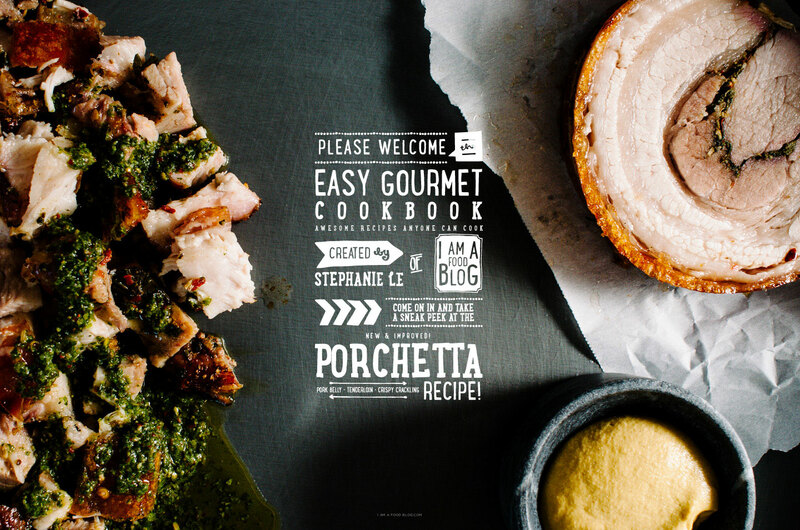 Thank you for posting this – I’ve been dying to make porchetta. Should I let the meat come to room temperature before cooking it? Hi Ann, I like to pull the porchetta out of the fridge as I’m warming up the oven. Other than that, you don’t really need to bring it to room temp. Hope that helps! Yes! Just trim it to the appropriate shape. Great recipe, I must to try it, thanks! Just made the Porketta for friends. So good and fairly easy. Hardest part was really trimming down the loin to make it fit the belly. Thanks for recipe. It was delicious. I also used your no-knead cinnamon buns for my strawberry buns. I posted pictures of the porketta on my blog.